James Howard "Jim" Thome (/ˈtoʊmi/; born August 27, 1970) is a former American baseball player who played 22 seasons in Major League Baseball (MLB), from 1991 to 2012. 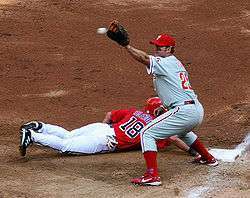 He played for six different teams, most notably the Cleveland Indians during the 1990s and the Philadelphia Phillies in the early 2000s. A prolific power hitter, Thome hit 612 home runs during his career—the seventh-most all time—along with 2,328 hits, 1,699 runs batted in (RBIs), and a .276 batting average. He was a member of five All-Star teams and won a Silver Slugger Award in 1996. At the conclusion of the 2002 season, Thome, who was a free agent, rejected the Indians' offer, to instead sign a six-year, $85 million contract with the Philadelphia Phillies – he thought the Phillies were closer to winning a championship than the Indians. With the Phillies, Thome's salary rose from $8 million per year to $11 million per year. 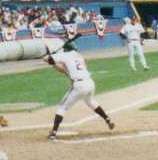 Thome hit a franchise record 334 home runs in his first stint with the Indians. On August 31, 2009, the White Sox traded Thome to the Los Angeles Dodgers along with financial considerations for minor league infielder Justin Fuller. Thome waived his no-trade clause because he thought the Dodgers could win the World Series, something he had never done during his career, but Thome's only appearances with the Dodgers were as a pinch hitter, due to chronic foot injuries that limited his mobility. An additional reason for Thome to come to Los Angeles was the opportunity to reunite with former Cleveland teammates Manny Ramirez and Casey Blake. He hit .235 with no home runs and three RBIs while with the Dodgers (4-for-17). After the season, Thome filed for free agency, eventually signing with the Minnesota Twins. Thome began his career playing third base and did so until the 1997 season, when he converted to first base to make room at third after the Indians traded for Matt Williams. Injuries, however, took their toll and confined him almost exclusively to being a designated hitter in the latter stages of his career. Overall, he spent 10 separate stints on the disabled list, mostly for his back. By the end of Thome's career, his back prevented him from playing the field effectively – he played first base four times with the Phillies in 2012 which marked the first time he played the field since 2007 with the White Sox. By the end of his career, writers described him as being a "huge liability in the field". ↑ "Jim Thome Stats". ESPN.com. Retrieved October 25, 2012. 1 2 3 Verducci, Tom (August 16, 2011). "Thome reaches 600 with humility, grace and country power". SI.com. Time Inc. Retrieved October 14, 2011. 1 2 3 4 Pluto, Terry (October 1, 1996). "Thome shows power of Peoria Indian: Third baseman's rural roots are apparent in his blue-collar work ethic and his ability to hit the ball a country mile". The Baltimore Sun. Retrieved January 18, 2014. 1 2 3 4 5 6 7 8 Bamberger, Michael (July 13, 1998). "The Pride of Peoria". Sports Illustrated. 89 (2): 98–105. Archived from the original on January 16, 2014. Retrieved April 26, 2013. ↑ Lee, Christopher (March 26, 2010). "Major League Baseball (MLB) Player Height and Weight". Sportsologist. Retrieved January 15, 2014. ↑ Rogers, Phil (April 19, 2006). "Jim Thome can't stop touching all the bases". Chicago Tribune. Retrieved February 17, 2013 – via HighBeam Research. (subscription required (help)). ↑ Sickels, John (January 21, 2011). "Jim Thome Career Profile". Minor League Ball – SBNation.com. Vox Media. Retrieved September 20, 2012. ↑ Lentz, Scott (January 29, 2013). "Is 2013 the Last Hoorah for Charlie Manuel in Philadelphia". Yahoo! Sports. Retrieved March 28, 2014. ↑ Lawrence, Ryan (January 15, 2014). "Report: Charlie Manuel rejoining Phillies". The Philadelphia Daily News. Retrieved March 28, 2014. ↑ Posnanski, Joe (September 27, 2010). "He's 40, but Jim Thome's mind isn't on retirement – Page Three". SI Vault. Time. Archived from the original on January 16, 2014. Retrieved April 11, 2013. ↑ "Jim Thome Minor League Statistics & History". Baseball Reference. Retrieved March 7, 2014. ↑ "September 4, 1991 Cleveland Indians at Minnesota Twins box score and play by play". Baseball Reference. Retrieved April 13, 2014. 1 2 3 4 5 "Jim Thome Statistics and History". Baseball Reference. Retrieved October 29, 2012. 1 2 3 "Jim Thome career home runs". Baseball Reference. Retrieved April 13, 2014. 1 2 3 4 5 6 7 8 9 Palmer, Pete, ed. (2007). Who's Who in Baseball, 2007. New York: Who's Who in Baseball Magazine Co. pp. 169–170. ISBN 0-910692-26-2. 1 2 3 Kazzie, David (April 6, 1994). "After 40 years of futility, Tribe will dance to new drum". The Cavalier Daily. Retrieved December 2, 2012. ↑ The Baseball Chronicle. Lincolnwood, Illinois: Publications International, Ltd. 2002. pp. 592, 600, 616, 622, 650, 656. ISBN 0-7853-7012-9. 1 2 "Box Score of game played on Wednesday, June 22, 1994 at Tiger Stadium". Baseball Almanac Box Scores. Baseball-Almanac. Retrieved April 1, 2013. 1 2 "1995 Cleveland Indians Batting, Pitching, & Fielding Statistics". Baseball Reference. Retrieved April 16, 2014. ↑ Ringolsby, Tracy (March 31, 1996). "American League Central Preview". Rocky Mountain News. Denver, Colorado. p. Special Pullout. Retrieved April 1, 2013 – via HighBeam Research. (subscription required (help)). ↑ "Box Score of game played on Sunday, July 16, 1995 at Jacobs Field". Baseball Almanac Box Scores. Baseball-Almanac. Retrieved April 1, 2013. 1 2 "The Ballplayers – Jim Thome". BaseballLibrary.com. Retrieved July 8, 2009. ↑ Ringolsby, Tracy (November 16, 1997). "Marlins, Reds begin cleaning house". Rocky Mountain News. Denver, Colorado. p. Sports. Retrieved April 1, 2013 – via HighBeam Research. (subscription required (help)). ↑ Housenick, Mandy (October 28, 2009). "Potent Phillies, Yankees bats, homer-friendly parks could mean crowd-pleasing slugfest". The Morning Call. Allentown, Pennsylvania. Retrieved March 7, 2014. ↑ "Thome powers Indians". Milwaukee Journal Sentinel. Associated Press. July 14, 1998. p. 5C. Retrieved October 29, 2012. ↑ "Thome, Wright spark Indians by Yankees". Lewiston Morning Tribune. Associated Press. July 14, 1998. p. 4B. Retrieved October 29, 2012. ↑ "Cleveland Loses Thome In Victory at Tampa Bay". The New York Times. August 8, 1998. Retrieved October 29, 2012. 1 2 Pearlman, Jeff (March 23, 1999). "1999 Sports Illustrated Baseball Preview – Cleveland Indians". Sports Illustrated. Archived from the original on July 25, 2008. Retrieved April 9, 2013. ↑ "Indians club Yanks, take 2–1 series lead". Sun Journal. Lewiston, Maine. Associated Press. October 10, 1998. p. C3. Retrieved October 29, 2012. 1 2 "Indians Postseason Results". indians.com: History. MLB. Retrieved January 16, 2014. ↑ "CNN/SI AL Recap (Cleveland-NY Yankees)". CNN/SI. May 31, 1999. Archived from the original on January 16, 2014. Retrieved October 29, 2012. ↑ "Indians break playoff jinx; injury sidelines Martinez". The Post and Courier. Charleston. Associated Press. October 7, 1999. p. 2C. Retrieved October 29, 2012. ↑ "MLB Scoreboard: Recap". CNN/SI. June 22, 2000. Archived from the original on January 16, 2014. Retrieved October 29, 2012. ↑ Withers, Tom (September 30, 2000). "Indians clinging to hope". Pittsburgh Post-Gazette. Associated Press. p. D5. Retrieved October 29, 2012. ↑ "Indians Year-By-Year Results". indians.com: History. MLB. Retrieved February 21, 2013. ↑ "Top 25 Home Runs in 2001 in the American League". Baseball Almanac. Retrieved April 18, 2014. ↑ "Juan Gonzalez Stats". ESPN. Retrieved April 18, 2014. ↑ "2001 League Division Series – Seattle Mariners over Cleveland Indians (3–2)". Baseball Reference. Retrieved October 29, 2012. ↑ "2002 American League Batting Leaders". Baseball Reference. Retrieved January 16, 2014. ↑ Bryant, Howard (2006). Juicing the Game: Drugs, Power, and the Fight for the Soul of the Major League. New York: Penguin. p. 136. ISBN 978-1-4406-4955-4. ↑ "Sources: Phillies, Thome agree to six-year deal". CNNSI.com – Baseball. Time. Associated Press. December 3, 2002. Archived from the original on May 11, 2008. Retrieved January 16, 2014. ↑ "Top 50 free agents". ESPN.com. Retrieved September 4, 2008. 1 2 Crasnick, Jerry (August 26, 2011). "Minnesota Twins trade Jim Thome to Cleveland Indians". ESPN.com. Retrieved October 18, 2012. ↑ Kimball, Bob (August 26, 2011). "Cleveland Indians reacquire Jim Thome". USA Today. Washington, D.C. Retrieved October 18, 2012. ↑ "2003 MLB Team and Player Stats". Major League Baseball – ESPN. Retrieved April 16, 2014. ↑ Miller, Stephen (August 26, 2006). "Wolf, Howard help Phillies hold off Mets". The Morning Call. Allentown, Pennsylvania. Retrieved April 18, 2014. ↑ "Baseball Roundup; Thome Hits 400th Home Run of Career". The New York Times. June 15, 2004. Retrieved April 1, 2009. ↑ White, Paul (August 10, 2005). "Questions about honesty, lefties and public personas". USA Today. Retrieved February 21, 2013. 1 2 Chen, Albert (August 1, 2005). "First Priority". Sports Illustrated. 103 (4). Archived from the original on February 1, 2014. Retrieved November 2, 2012. 1 2 "White Sox send Rowand to Phils for Thome". ESPN.com. November 25, 2005. Retrieved July 8, 2009. ↑ Associated Press (November 7, 2005). "Street wins AL Rookie of Year; Howard wins NL". MLB – ESPN. Retrieved February 21, 2013. ↑ Zolecki, Todd (April 4, 2005). "A piece of the rock: Jim Thome's mother was his family's foundation. He's building on that.". The Philadelphia Inquirer. Retrieved January 18, 2014. ↑ Stark, Jayson (August 16, 2011). "Jim Thome a truly real and caring person". ESPN.com. Retrieved November 1, 2012. ↑ Associated Press (April 29, 2006). "Contreras masterful again as White Sox slip past Halos". ESPN. Retrieved April 16, 2014. ↑ Associated Press (April 23, 2006). "Uribe powers ChiSox past Twins for eighth straight win". ESPN. Retrieved April 16, 2014. ↑ "Major League Leaderboards – 2006 – Batters – Advanced Statistics". FanGraphs. Retrieved September 12, 2012. ↑ Merkin, Scott (May 2, 2006). "Thome, Sox silence Cleveland critics". MLB.com. Retrieved November 1, 2012. 1 2 "For the Record". Sports Illustrated. 107 (12): 22. September 24, 2007. Archived from the original on March 25, 2014. Retrieved March 25, 2014. ↑ "Thome reaches 500 HR milestone in walk-off fashion". ESPN. September 16, 2007. Retrieved April 18, 2014. ↑ Merkin, Scott (September 16, 2007). "Thome family shares in joy of No. 500". whitesox.com. MLB. Retrieved April 29, 2013. ↑ Gyr, Alex (September 16, 2007). "Thome's quest for 500 ends with win". whitesox.com. MLB. Retrieved April 29, 2013. ↑ Gregor, Scot (June 6, 2008). "How far did Thome's HR fly?". Daily Herald. Arlington Heights, Illinois. Retrieved February 21, 2013 – via HighBeam Research. (subscription required (help)). ↑ "September 30, 2008 Minnesota Twins at Chicago White Sox Play by Play and Box Score". Baseball Reference. Retrieved July 8, 2009. ↑ Gano, Rick (June 5, 2008). "White Sox beat Royals in 15 on Konerko homer". Yahoo! Sports. Retrieved June 6, 2008. ↑ "Jim Thome's 7 RBIs lead Chicago White Sox past Baltimore Orioles, 12-8". Los Angeles Times. Associated Press. July 18, 2009. Retrieved February 21, 2013. ↑ Eymer, Rick (August 15, 2009). "Thome matches Reggie on all-time list". MLB.com. Retrieved November 1, 2012. ↑ "Chicago White Sox deal Jim Thome, Jose Contreras at deadline". ESPN Chicago. September 1, 2009. Retrieved November 1, 2012. ↑ Rogers, Phil (September 2, 2009). "Jim Thome shows once again why he's a throwback player". Chicago Tribune. Retrieved November 5, 2012. ↑ Ely, David (September 2, 2009). "Pinch-hitting role suits Thome fine in LA". MLB.com. Retrieved September 4, 2009. ↑ Levy, Mike (September 1, 2009). "Ex-Cleveland Indians sluggers Jim Thome and Manny Ramirez re-unite on Los Angeles Dodgers". The Plain Dealer. Cleveland, Ohio. Retrieved April 16, 2014. ↑ Pete Palmer, ed. (2010). Who's Who In Baseball 2010 (95th ed.). New York: Who's Who in Baseball Magazine Co. pp. 171–172. ↑ "Twins defeat Red Sox in first game at outdoor Target Field". ESPN. April 12, 2010. Retrieved April 12, 2014. ↑ Berman, Chris (April 4, 1994). Video: Indians win Jacobs Field opener. Cleveland, Ohio: MLB. ↑ "Progressive Field History" (PDF). indians.com. MLB. 2009. Retrieved April 20, 2014. ↑ Shenk, Larry (April 3, 2014). "Citizens Bank Park 'firsts' through history". phillies.com. Retrieved April 20, 2014. ↑ Hartman, Sid (July 3, 2010). "Thome humbled to pass Killebrew". Star Tribune. Minneapolis. Retrieved April 16, 2014. ↑ Kay, Joe (August 16, 2011). "Thome hits 600th home run". Baseball – NewsObserver.com. McClatchy Newspapers. Retrieved November 2, 2012. ↑ "Jim Thome passes Harmon Killebrew for 10th place on HR list". MLB News. Fox Sports Interactive Media, LLC. July 3, 2010. Retrieved November 29, 2012. ↑ "Twins stretch AL Central lead to 4 thanks to Jim Thome homer in 10th". ESPN. August 17, 2010. Retrieved April 13, 2014. ↑ Abnos, Alexander (June 25, 2012). "Jim Thome hits 13th walk-off home run, an MLB record". SI Wire. Time. Retrieved April 18, 2014. ↑ "Jim Thome passes Mark McGwire for 9th on HR list in Twins' victory". ESPN. September 4, 2010. Retrieved April 13, 2014. ↑ "September 11, 2010 Minnesota Twins at Cleveland Indians Play by Play and Box Score". Baseball Reference. September 11, 2010. Retrieved September 14, 2011. ↑ Posnanski, Joe (September 27, 2010). "He's 40, but Jim Thome's mind isn't on retirement – Page Five". SI Vault. Time. Archived from the original on January 17, 2014. Retrieved April 11, 2013. ↑ Thesier, Kelly (August 18, 2010). "Thome's blast ups Twins' lead to four games". MLB.com: News. Retrieved November 1, 2012. ↑ Jim Thome's 2002 Stats Retrosheet Accessed November 1, 2012. ↑ "Jim Thome gets 1-year deal from Twins". ESPN. January 14, 2011. Retrieved April 13, 2014. ↑ Schelling, Jordan (July 17, 2011). "Jim Thome's mammoth blast, No. 596, lifts the Twins over Royals". MLB.com: News. Retrieved November 2, 2012. ↑ Bollinger, Rhett (August 16, 2011). "Thome becomes eighth to hit 600 homers". MLB.com: News. Retrieved April 16, 2014. ↑ Bastian, Jordan (August 25, 2011). "Thome waives no-trade, returns to Indians". MLB.com: News. Retrieved November 1, 2012. ↑ AP (August 26, 2011). "Minnesota Twins trade Jim Thome to Cleveland Indians". ESPN.com. Retrieved November 1, 2012. ↑ Gleeman, Aaron (September 19, 2011). "Twins get $20,000 from Indians to complete Jim Thome deal". NBC Sports. HardballTalk. Retrieved April 16, 2014. ↑ Hoynes, Paul (September 18, 2011). "Tribe sends $20K to Twins to complete Thome deal". The Plain Dealer. Cleveland, Ohio. Retrieved March 28, 2014. ↑ Bastian, Jordan (September 24, 2011). "Thome's night ends with Santana's walk-off homer". MLB.com. Retrieved November 6, 2011. ↑ "Ryan Howard Statistics and History". Baseball Reference. Retrieved October 15, 2011. ↑ "Indians All-Time Leaders". indians.com: History. MLB. Retrieved October 20, 2012. ↑ "Phillies sign Thome to 1-year deal". USA Today. Associated Press. November 4, 2011. Retrieved February 22, 2013. ↑ Zolecki, Todd (November 5, 2011). "Jim Thome ready to pinch-hit, play for Phillies". phillies.com: News. Retrieved March 12, 2013. ↑ Zolecki, Todd (November 5, 2011). "Jim Thome back with Phillies on one-year deal". MLB.com News. Retrieved April 16, 2014. ↑ Associated Press (April 8, 2012). "Philadelphia Phillies vs. Pittsburgh Pirates – Recap – April 08, 2012". ESPN. ESPN Internet Ventures. Retrieved April 29, 2013. ↑ Brookover, Bob (May 1, 2012). "Jim Thome struggling as pinch-hitter". The Philadelphia Inquirer. Retrieved May 1, 2012. ↑ Associated Press (June 6, 2012). "Philadelphia Phillies activate Jim Thome from disabled list, option Pete Orr to Triple-A". ESPN. Retrieved April 18, 2014. ↑ Housenick, Mandy (June 16, 2012). "With Interleague soon over, will Jim Thome be just a pinch hitter for the Phillies?". The Morning Call. Lehigh Valley, Pennsylvania. Retrieved February 20, 2013. ↑ Zolecki, Todd (June 29, 2012). "Phillies could trade Thome to AL team soon". phillies.com: News. MLB. Retrieved February 20, 2013. ↑ "Colby Rasmus 3 for 4 with homer, 3 RBIs as Blue Jays cap sweep". ESPN. June 17, 2012. Retrieved April 13, 2014. ↑ Kaplan, Jake (June 23, 2012). "Thome's walk-off caps day of Phils milestones". MLB.com. Retrieved 2012-06-24. ↑ Luca, Greg (June 30, 2012). "Orioles trade for Jim Thome from Phillies". MLB.com: News. Retrieved February 20, 2013. 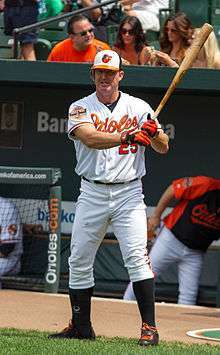 ↑ "Baltimore Orioles acquire Philadelphia Phillies' slugger Jim Thome". ESPN. July 1, 2012. Retrieved November 28, 2012. ↑ Connolly, Dan (June 30, 2012). "Orioles close to closing deal for Jim Thome". The Baltimore Sun. Retrieved November 28, 2012. 1 2 Carpenter, Les (July 17, 2012). "Jim Thome, he of 600 home runs, loves baseball so much it's infectious to his Orioles teammates". Yahoo! Sports. Retrieved July 18, 2012. ↑ "Jim Thome hits home run No. 610, seventh all-time". The Seattle Times. Associated Press. July 20, 2012. Retrieved November 29, 2012. ↑ Ghrioli, Brittany (August 6, 2012). "Thome out until September with herniated disc". orioles.com: News. MLB. Retrieved November 29, 2012. ↑ Ulman, Howard (September 22, 2012). "Orioles Beat Red Sox: Jim Thome lifts Baltimore to 16th straight win in extra innings". Sporting News on AOL. TheHuffingtonPost.com. Retrieved November 29, 2012. ↑ "Indians lose to old friend Jim Thome". The Seattle Times. Associated Press. July 21, 2012. Retrieved October 18, 2012. ↑ "Jim Thome Statistics and History". Baseball Reference. Retrieved November 29, 2012. ↑ Gonzales, Mark (July 2, 2013). "Chicago White Sox Jim Thome special assistant". Chicago Tribune. Retrieved September 11, 2013. ↑ Van Schouwen, Daryl (February 23, 2014). "White Sox' Jim Thome wants to manage in future". Chicago Sun-Times. Retrieved April 3, 2014. ↑ Heyman, Jon (March 5, 2014). "Thome loves front office job but if someone offers playing job, well ...". CBS Sports. Eye on Baseball. Retrieved April 3, 2014. ↑ Snyder, Matt (August 2, 2014). "Jim Thome officially retires as an Indian with one-day contract". CBS Sports. Retrieved August 2, 2014. ↑ Gaines, Cork (May 23, 2012). "The 20 Greatest Power Hitters of All-Time". Business Insider. Retrieved February 25, 2013. 1 2 Gleeman, Aaron (February 22, 2013). "Jim Thome is looking for work". HardballTalk. NBC Sports. Retrieved February 25, 2013. ↑ "Best designated hitters ever". FOX Sports. October 10, 2011. Retrieved March 5, 2013. ↑ "Jim Thome Scouting Report". Inside Edge – ESPN. Retrieved March 5, 2013. (subscription required (help)). ↑ Greenberg, Jon (May 6, 2006). "Notes: Shift doesn't bother Thome". MLB.com: News. Retrieved March 5, 2013. ↑ Bollinger, Rhett (April 5, 2011). "Defensive shift a new challenge for Mauer". twinsbaseball.com: News. MLB. Retrieved March 5, 2013. ↑ O'Neill, Shane, ed. (February 2011). "Lindy's Sports Baseball 2011 Preview". Birmingham, Alabama: J. Lindy Davis Jr.: 176. 1 2 Posnanski, Joe (September 27, 2010). "He's 40, but Jim Thome's mind isn't on retirement – Page Four". SI Vault. Time. Archived from the original on January 16, 2014. Retrieved April 11, 2013. ↑ "Career Stolen Bases – Jim Thome". Sportometry. Tangraph Technologies. Retrieved April 11, 2013. ↑ Gonzales, Mark (September 14, 2007). "Moving day was a blessing: Thome's switch from 3rd base to 1st jump-started career". Chicago Tribune. Retrieved March 3, 2013 – via HighBeam Research. (subscription required (help)). ↑ Whiteside, Larry (March 1, 1997). "Indians hope Williams will be bellwether – They're counting on ex-Giant for punch". The Boston Globe. Retrieved March 3, 2013 – via HighBeam Research. (subscription required (help)). ↑ Palmer, Pete, ed. (2012). 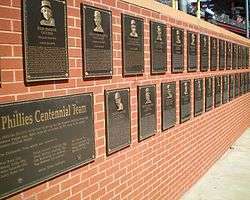 Who's Who In Baseball. New York: Who's Who in Baseball Magazine Co. p. 175. ISBN 0-910692-32-7. ↑ "Thome, Orioles win 16th straight in extra innings". Boston News, Weather, Sports – FOX 25 – MyFoxBoston. Fox Television Stations. September 22, 2012. Retrieved February 25, 2013. ↑ Associated Press (June 6, 2012). "Philadelphia Phillies activate Jim Thome from disabled list, option Pete Orr to Triple-A". ESPN. Retrieved February 25, 2013. ↑ Perry, Dayn (August 7, 2012). "Jim Thome could miss rest of season". CBS Sports. Retrieved February 26, 2013. ↑ Vetrone Jr., Bob (June 21, 2012). "Our Jim Thome Plan". The Philadelphia Inquirer. Retrieved March 3, 2013. ↑ "Jim Thome Fielding Statistics and History". Baseball Reference. Retrieved March 3, 2013. ↑ "Jason Giambi, Andy Pettitte among members of age 40 club that are still making impact in majors". NESN.com. New England Sports Network. Retrieved April 9, 2013. ↑ Meisel, Zack (August 26, 2011). "Indians welcome Jim Thome back by emulating his high socks". indians.com: News. MLB. Retrieved March 30, 2013. 1 2 Ryness, Gar; Dewart, Caleb (2010). Batting Stance Guy: A Love Letter to Baseball. Simon & Schuster. pp. 32, 217. ISBN 978-1-4391-8172-0. Retrieved March 30, 2013. ↑ Kepner, Tyler (August 20, 2011). "Thome's success rooted in a simple suggestion". The New York Times Baseball Blog. Retrieved March 30, 2013. ↑ "SI.com – MLB – SI Players Poll: Friendliest/Unfriendliest MLB Player?". Sports Illustrated. May 16, 2007. Archived from the original on July 24, 2012. Retrieved 2012-04-05. 1 2 Kurkjian, Tim (August 17, 2011). "Jim Thome as genuine as they come". ESPN The Magazine. Retrieved March 30, 2013. ↑ Snyder, Matt (November 4, 2011). "Jim Thome signs with Phillies". CBS Sports. Retrieved March 30, 2013. ↑ Posnanski, Joe (September 27, 2010). "He's 40, but Jim Thome's mind isn't on retirement – Page Two". SI Vault. Time. Archived from the original on January 16, 2014. Retrieved April 11, 2013. ↑ Silver, Stephen (January 16, 2013). "Jim Thome's faltering case for the Hall of Fame". Philadelphia Magazine. The Philly Post – News. Retrieved January 15, 2014. ↑ Arcand, Tim (June 30, 2010). "Gentleman Jim Thome set to make history as a Minnesota Twin". Bleacher Report. Turner Broadcasting System. Retrieved December 2, 2012. ↑ "Jim Thome – Statistics – Batting". FanGraphs Baseball. Stats LLC. Retrieved March 14, 2013. ↑ Shea, John (August 14, 2011). "Jim Thome has clean reputation amid steroid era". San Francisco Chronicle. Retrieved March 14, 2013. ↑ Couch, Greg (August 16, 2011). "In an era of cheats, Thome is a player worth believing in". SportingNews.com. MLB. Retrieved March 14, 2013. ↑ Reynolds, Dave (November 23, 2013). "Hall of Fame voters eager for Jim Thome ballot". Journal Star. Peoria, Illinois. Retrieved January 21, 2014. ↑ Peick, Sean (June 24, 2012). "Jim Thome's tremendous numbers likely won't be enough to get him into the Hall of Fame on first ballot". New England Sports Network. MLB. Retrieved January 21, 2014. ↑ Wessler, Kirk (November 23, 2013). "Why doesn't anyone talk about Jim Thome?". Journal Star. Peoria, Illinois. Retrieved January 21, 2014. ↑ Silver, Stephen (January 16, 2013). "Jim Thome's faltering case for the Hall of Fame". Philadelphia. The Philly Post. Retrieved March 14, 2013. ↑ Brown, David (December 12, 2007). "Sox entertain kids at holiday party". MLB.com. Retrieved December 9, 2012. ↑ "Jim Thome: Postseason Players". MLB.com. Retrieved December 2, 2012. ↑ "Thome's shot trumps McGwire's slam". Los Angeles Times. Associated Press. July 8, 2001. Retrieved January 23, 2013. ↑ Hunter, Justin (July 1, 2012). "The Unappreciated Career of Jim Thome". Call to the Pen. Fansided. Retrieved November 28, 2013. ↑ Merkin, Scott (November 27, 2013). "Jim Thome donates $100,000 to help with tornado relief". phillies.com: News. MLB. Retrieved November 28, 2013. 1 2 Hageman, William (September 15, 2013). "Andrea Thome on why she volunteers". Chicago Tribune. Retrieved April 6, 2014. ↑ Just, David (January 13, 2008). "Thome hosts annual charity event". whitesox.com: News. MLB. Retrieved April 6, 2014.